Russian House and StarTribe Alliance invite you to special community event! Two days of wonderous workshops, exciting communal projects, rich home-cooked nourishment, discussions, ceremony, celebration, art, and music! 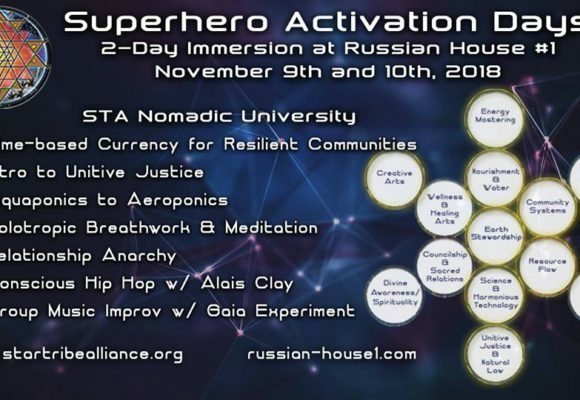 Come help improve, grow, and strengthen this amazing space while enjoying the inspirational companionship of fellow Superhero activators! Please bring your own inspirations and plan to share your ideas and visions that can help fuel the mission to co-create harmony and regenerative living on earth! The Russian House has a kitchen that will provide food by donation. Please feel free to bring your own potluck dishes to share at mealtimes, and contribute to the communal sustenance. We are requesting a 20-40$ donation per day, but no one will be turned away, and volunteer-based contributions are welcome.